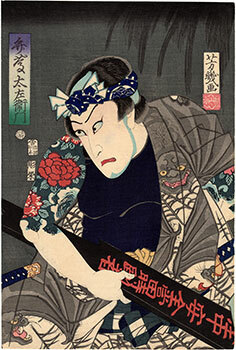 Musashibo Benkei (武蔵坊弁慶) was a sohei (僧兵) warrior monk who lived in the 12th century. His adventures have become legendary and it is now impossible to distinguish historical truth from myth. 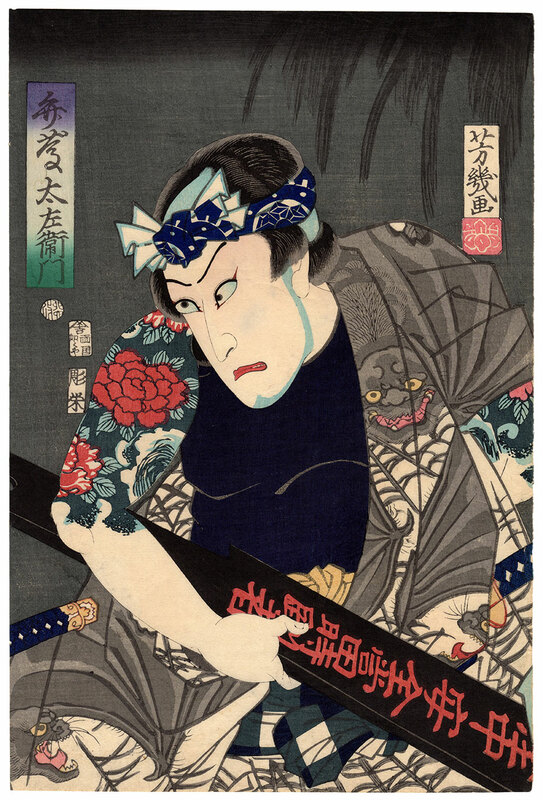 At some point in his life - the one depicted in this print - Benkei lurked on the Gojo Bridge (五条大橋), in Kyoto (京都), and there he challenged to a duel the warriors who wanted to cross it to get as a reward the weapons of the defeated opponents. According to tradition, in fact, he had asked a famous swordsmith to forge a armour for him, and the latter accepted as long as Benkei brought him a thousand swords. 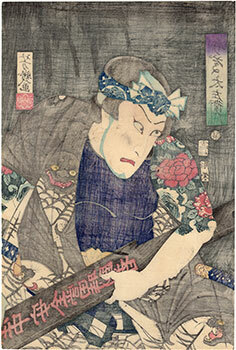 And, in effect, he managed to get nine hundred ninety-nine swords, until, on that bridge, he was defeated by his future lord Minamoto no Yoshitsune (源義経). In the precious woodblock print presented here, central table of a triptych made by the artist Utagawa Yoshiiku (歌川芳幾) and entitled "Parody of Benkei on the bridge" (見立橋弁慶), the protagonist is presented with the scene name "Benkei Dazaemon" (弁慶太左衛門). The work, printed in 1867 by the publisher Kagaya Kichiemon (加賀屋吉右衛門), is in very good condition.